Both Quito in Ecuador and Singapore are on the Equator. One can fly due eastward from Singapore and reach Quito in due course. However, this is not the shortest route. The equatorial trans-Pacific route from Singapore to Quito is not a geodesic on Earth! Why not? A drastically flattened spheroid. Clearly, the equatorial route between the blue and red points is not the shortest path. We are all familiar with the measurement of speed, the distance travelled in a given time. Allowing for the direction as well as the magnitude of movement, we get velocity, a vector quantity. In the flow of a viscous fluid, such as treacle pouring off a spoon, the velocity is smooth and steady. Such flow is called laminar, and variations of velocity from place to place are small. By contrast, the motion of the atmosphere, a fluid with low viscosity, can be irregular and rapidly fluctuating. We experience this when out and about on a gusty day. Such chaotic fluid flow is called turbulence, and this topic continues to challenge the most brilliant scientists [TM130 or search for “thatsmaths” at irishtimes.com]. Seventy percent of the Earth is covered by water and three quarters of the world’s great cities are on the coast. Ever-rising sea levels pose a real threat to more than a billion people living beside the sea. As the climate warms, this is becoming a greater threat every year [TM113 or search for “thatsmaths” at irishtimes.com]. Try to wrap a football in aluminium foil and you will discover that you have to crumple up the foil to make it fit snugly to the ball. In the same way, it is impossible to represent the curved surface of the Earth on a flat plane without some distortion. [See this week’s That’s Maths column (TM068): search for “thatsmaths” at irishtimes.com]. 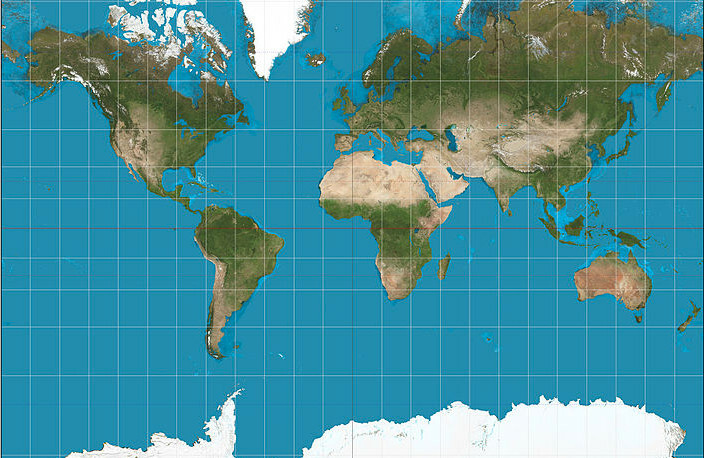 Mercator projection of the Earth, truncated at 75 degrees North and South [Wikimedia Commons, author: Strebe].